Energetic Forum - View Single Post - Can a Mag Amp Produce Unlimited Gain from 1 Micro VDC? Thread: Can a Mag Amp Produce Unlimited Gain from 1 Micro VDC? Current does not maintain itself along a series circuit as evidenced by Eric's video. Obviously a TEM arrangement. Not the same as mine. then I got excited and tried to loop it back to the source to try to maintain the "Energy" while powering the load..
but what about the gain?.. well I have more light.. and an output while having light.. instead of just a single bright light.. a bit lousy reasoning but that is how I understood it, and I didn't bother to accurately measure..
going back to "infinite watts" circuit.. let say you manage to get a "gain" from that circuit.. the backemf / lenz law increased the current all throughout the circuit... EVEN AT THE PRIMARY COIL CONNECTED TO THE 60hz GRID.. now what would be the limit of the current?... I would say it will depend on that inductor with the "Infinity" symbol... since it has no load it serves as a ballast.. since all your transformers have lenz effect in them cancelling the magnetic fields and increasing the current..
phase conjugation do exist.. but still, your circuit (inductor-Cap-Inductor-Cap loop), connection is a series one... series circuits have same current flowing in it.. the current that will induce the 3rd stage and 4th,5th and so on will be the same as the current in the first stage (ideal components)... sad to say, but in reality there are still loses..
Series circuits is not relevant. What's relevant is: "Does the circuit in question exhibit the predominant character of a TEM arrangement or an LMD? This will determine the outcome. the circuit might say an infinite current will build-up at the last coil.. but that's just not happening. at least in my circuits. it could have been better If it were powering loads at each stage. instead of just running transformers only.. It could have atleast show some gain.. but currently no..
the theory is interesting but. I think the simulator is not compliant to reality. That's the fact. Now for my speculation derived from Eric quoting Tesla's claim that Tesla achieved 50 times faster than the speed of light with his LMD experiments. I suspect this occurred when Tesla bounced an LMD wave off the moon. It's entire trip was much longer than that traveled by the LMD waves in Eric's experiment. Eric merely achieved one half pi times the speed of light: an acceleration of about 57% faster. Since I further speculate that LMD waves behave the opposite of TEM waves, then this explains how Tesla achieved such a miraculous feat. What is this difference between LMDs and TEMs? LMDs speed up as they travel through a compressed medium or through a vacuum since both mediums offer LMDs the same characteristic behavior: they allow shock waves to travel through them and an LMD is a shock wave, not a ripple wave such as a TEM. Of course, TEMs slow down as they travel through a lengthening of their medium of a conductive pathway. 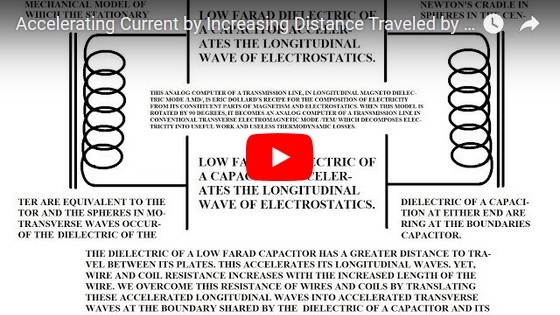 The mystery of accelerating current is to first accelerate an LMD by reducing capacitance to ridiculous levels (in proportion to the level of inductance of an LMD's coils). This reduction of capacitance will pragmatically require a greater distance for an LMD to travel through the dielectric of a capacitor relative to its surface area. This increased distance will accelerate an LMD. Furthermore, Newton's Cradle is a mechanical analog to how longitudinal waves actively translate into transverse waves. The stationary spheres in the center are passing longitudinal shock waves through them just as Tesla passed the same type of waves through bedrock emanating out of Wardenclyffe and also through the medium of empty space en route to the moon and back. The moving spheres on either end are exhibiting transverse wave behavior in as much as they will be the cause of this toy slowing down and eventually coming to a complete stop due to thermodynamic losses. The boundary between the moving spheres and the stationary spheres is analogous to the boundary between the dielectric and the conductive plates on either side of the dielectric material in a capacitor. Since space is the inverse relation to counterspace, the more the space the less the counterspace and vice versa. The less the counterspace, the less is the transit time for a longitudinal wave passing through both despite the increase of space. Space and counterspace are directly proportional for the inductance of a coil (resistors, such as lamps, notwithstanding). This has the effect of increasing resistance and dissipation (as heat) for the transverse wave within a coil whose wire has been lengthened. Space and counterspace are inversely proportional for the dielectric of a capacitor. This has the effect of decreasing transit time in counterspace and accelerating the rate of motion in space of a longitudinal wave when the span across the dielectric is increased. Last edited by Vinyasi; 05-05-2018 at 05:13 AM.